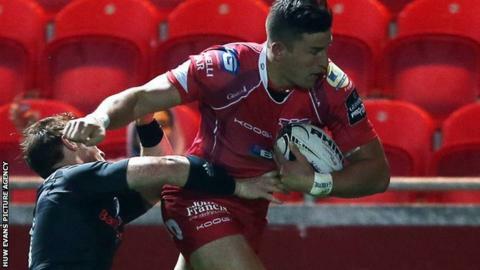 Steven Shingler's late penalty gave Scarlets a dramatic win over Munster which saw them overtake the Irish province at the top of the Pro12. Andrew Conway's breakaway try and eight points from Ian Keatley's boot put Munster 13-6 up at half-time. Scarlets fought back after the break as DTH van der Merwe and Tom Williams touched down to level at 16-16. With the final kick of the match, Shingler nailed his penalty to give Scarlets a fifth win from five games. Having won their first four games, Munster drop to second place after a first defeat of the campaign. Keatley was only drafted into the starting line-up after Tyler Bleyendaal withdrew through injury shortly before kick-off, and the fly-half kicked Munster into an early lead. Full-back Conway extended their advantage as he seized on a loose ball, kicked ahead and beat Scarlets wing Hadleigh Parkes to the ball to touch down. Shingler kept Scarlets in contention with two penalties, but another three points from Keatley put Munster 13-6 ahead at the break. The hosts came roaring back after the restart, and Van der Merwe scored his third try in only his second Scarlets appearance as he finished off a move started by half-time replacement Williams. Provider turned poacher soon afterwards as Williams, with the aid of a review from the television match official, scored in the corner to bring the scores level. Barely a minute later, however, Williams was sent to the sin bin for a high tackle on Conway, and a Keatley drop-goal edged Munster back in front at 19-16. A kicking duel between Keatley and Shingler ensued and, with two minutes left, Shingler's fourth penalty made it 22-22. Scarlets kept the ball and their cool in the closing stages and, with the final kick of the game, Shingler struck his fifth penalty to secure victory. Scarlets head coach Wayne Pivac told BBC Wales Sport: "Munster played really well and put us under a lot of pressure. "We didn't play well but I guess we took our scoring opportunities when we did and holding them with a man in the sin-bin was certainly a telling point as well. "There's plenty to work on but we'll take those four points." Scarlets: Aled Thomas; Hadleigh Parkes, Regan King, Gareth Owen, DTH van der Merwe; Steven Shingler, Rhodri Williams, Rob Evans, Ken Owens, Samson Lee, Jake Ball, Tom Price, Lewis Rawlins, John Barclay, James Davies. Replacements: Emyr Phillips, Phil John, Peter Edwards, George Earle, Jack Condy, Gareth Davies, Dan Jones, Tom Williams. Munster: Andrew Conway; Stephen Fitzgerald, David Johnston, Denis Hurley, Gerhard van den Heever; Ian Keatley, Cathal Sheridan; Dave Kilcoyne, Duncan Casey, BJ Botha; Robin Copeland, Mark Chisholm; Dave O'Callaghan, Jordan Coghlan, CJ Stander. Replacements: Niall Scannell, James Cronin, John Ryan, Dave Foley, Shane Buckley, Tomás O'Leary, Rory Scannell, Ronan O'Mahony.